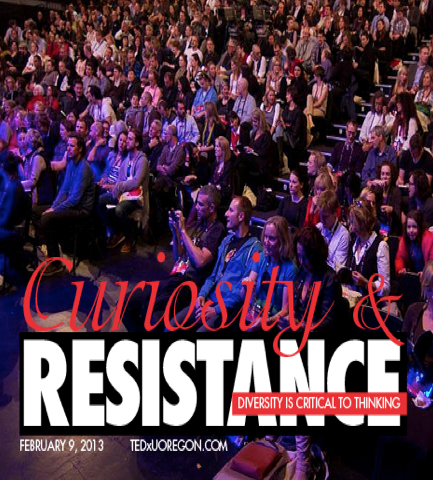 If you missed out on getting live-audience tickets for the UO’s TEDx conference on Saturday (Feb. 9), you can still see live streamed sessions for free at four locations on the UO campus and one in Portland. The streaming-media service is provided by the UO Libraries’ Center for Media and Educational Technologies (CMET). Although tickets for the live venue are no longer available, CMET’s streaming-media service has made it possible to watch the sessions live at the other screening locations. Tickets are required for viewing at the remote locations, but they are free of charge and can be printed by visiting the UO's TEDx website and clicking the "Live-Stream Viewing Locations" tab. Complete information on scheduled speakers and performers is also available at the site. CMET’s media streaming service allows members of the campus community to deliver live webcasts of courses and events for viewing on computers and display screens anywhere in the world. The live digital stream can be converted to traditional video-delivery formats, including CD-ROM and DVD, or posted to the UO Channel for on-demand viewing. Mike Majdic, CMET’s senior producer and director, can be contacted for information on video and broadcast services at 541-346-1945 or majdic@uoregon.edu). CMET’s Streaming Media web page has information about streaming media services available at the UO.